Towards the end of last year E-Z-GO initiated a rebranding of some of their product lines. They introduced their Terrain line of vehicles for what management describes as “trail-utility” applications and their Express line of vehicles for “trail-leisure” applications. The Terrain line consists of the Terrain 250 and 1000 in gas and electric configurations and the Terrain 500 and 1500 in gas only configurations. The Express line consists of the L4, S4, L6 and S6 models which all come in gas or electric versions. One dealer’s website describes the Terrain line being for cargo and the Express line being for people. From my understanding the old E-Z-GO ST product line has been rebranded as E-Z-GO Terrain & Express models, and as the Cushman Hauler models, and some as Bad Boy Buggies. While the guts of the vehicles have not been changed substantially, the front body panel, the cowl, headlights and canopy top have been changed and the top supports are beefier as well. Net income of $227.6 million – 55% more than 2010. The overall ATV market declined low double digits for 2011 while side-by-sides increased low double digits. 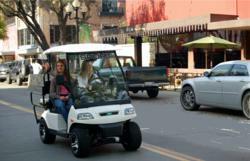 Polaris sales through their partnership with Bobcat increased 60% in 2011. Polaris has discontinued their Breeze LSV in light of their GEM acquisition and production of GEMs in their Spirit Lake facility has begun. Expectations for a slower level of growth for the company and ORV sales for the coming year.